All phone users know how easy it can be for their messages to be misinterpreted over text. A sarcastic remark or joke can quickly turn into a disaster if the other person reads it the wrong way. Luckily for iOS users, someone finally decided to do something about it. 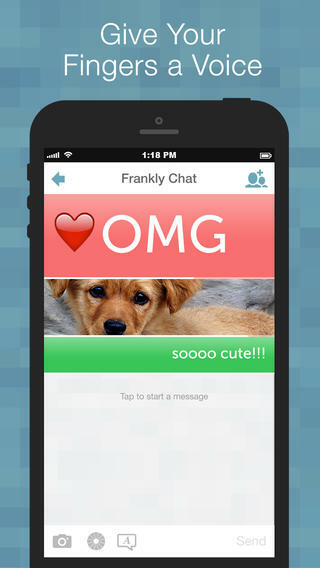 The Frankly Messenger is frankly the best way to communicate with friends and family. Heck, it’s even the best way to communicate with your enemies. What makes this app so amazing is the control which users have over message customization. The size of the message’s font can be changed and so can the message’s background. Adding a warm color for example and keeping the font size of a message makes it easier for the person receiving the message to understand the context of what is being said. Similarly, if someone receives a message with a cold color and HUGE font, they will also understand the message differently. The other great thing about the Frankly Messenger is that messages only appear for 10 seconds. If the sender decides they want to “unsend” their message and stop the receiving user from opening, or finish reading the message, they can do that by tapping an “X” icon. In addition to all of the great features that the Frankly Messenger has, it also lets you send images. I don’t know how this app could get any better, but the image functionality just made it ten times better! While using this app I wasn’t able to find an option for increasing the amount of time the receiver has to read the message. I would think that longer messages would require longer reading times than 10 seconds. But it’s not that big of a deal. I feel like messages that take longer than 10 seconds to read are usually never sent over text message anyways, so why do that on Frankly? Quite franklyÂ this is a must-have app. If you’re tired of being misunderstood over text, or tired of the boring style of it all, then Frankly Messenger is a perfect messaging solution for communicating with your friends and family. It’s easily the best thing to happen to iOS messaging since the release of Emoji’s and Snapchat. By the way, this app is also available on Android 🙂 That means that you can invite friends over to Frankly Messenger even if they aren’t cool enough to have an iPhone [kidding. The Galaxy and Moto phones are cool too…].